Foot Foundation specializes in various alterations to footwear. From general repairs to orthopedic modifications to stretching, we’d be happy to assist you with increasing the comfort, performance and cosmetics of your footwear. Below are a number of traditional orthopedic modifications we can offer with better-than-average results. 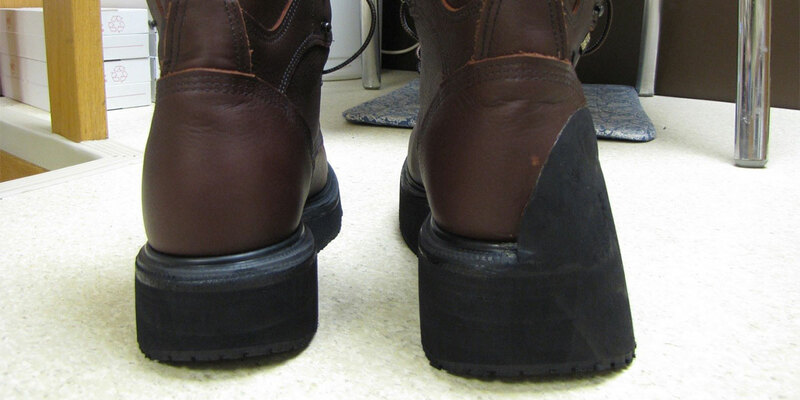 BOOT SHAFT ALTERATIONS: Modifications done to remove or add material, elastic, or zippers to custom fit any leg fitting issues for high shoes or boots extending up the leg. BUTTRESS: A permanent, external modification to the outsole, midsole and the upper of a shoe. This bolsters the medial and/or lateral support through the mid and rearfoot. CLOSURE MODIFICATION: A permanent, external modification of the upper of the shoe by the addition of leather or other materials. This can include the addition of hook & loop (velcro) straps, buckles, zippers, or a closure system including both hook & loop and lacing (lace stitch velcro). This modification allows the use of footwear by an individual who, previously, may not have been able to use the original closure due to bony deformity of the foot or dysfunction of the hands, back, hips or knees. CUSTOM-MADE TOE SPLINT: A device manufactured from a raw material (typically a silicon-like material) designed to re-align, separate, or support a deformed or deviated toe(s). EXTERNAL METATARSAL BAR: A permanent, external modification to the midsole in which a “bar” of material is added beneath the ball area of the foot to change the flex point of the shoe. This is similar to a ROCKER SOLE, but with less adjustability and specificity of treatment. FLARE: A permanent, external modification to the midsole and outsole to widen the base of support on the inside (medial) or outside (lateral) portion of the shoe. INTERNAL HEEL LIFT: A non-permanent, internal modification by adding a specific height to address a minor, or portion of a major, leg length discrepancy. Used as a pair, internal heel lifts are also useful in the treatment of Achilles tendonitis and Sever’s Disease as well as issues of footwear fit. METATARSAL PAD (MET PADS): A permanent, internal modification that adds a dome shaped pad under the metatarsal bones (just behind the ball) to maintain or correct the transverse arch. This is typically used to reduce plantar pressure discomfort at the ball of the feet. ORTHOPEDIC STRETCHING: Stretching of quality leather footwear above and beyond traditional stretching. This is used for the relief of bunions, bunionettes, hammer toes, and other deformities of the feet. 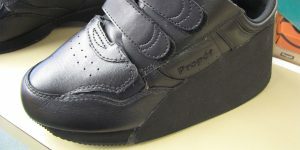 POSTING (WEDGING): A permanent or temporary, internal or external modification of a shoe or insole by the addition of “wedges” or “shims” to modify the angle of the rearfoot (heel) and/or forefoot (ball). Often used internally as a pre-orthotic trial to determine efficacy of corrective treatment. ROCKER SOLE (forefoot, ankle joint or heel): A permanent, external modification to the midsole and outsole in which material is added and the ground reaction force of the shoe is modified to allow improved function, or for protection of the foot and ankle. SACH HEEL (SOLID ANKLE CUSHION HEEL): A permanent, external modification by adding a softer durometer (compressible) material replacing a portion of the back heel base. SACH heels reduce shock at heel strike and compensates for diminished ankle motion. SCAPHOID PAD (ARCH COOKIE): A permanent, internal modification that adds padding to the medial longitudinal arch of a shoe. This is typically used for children or individuals requiring a lifting of the inside arch of the foot when custom made foot orthoses are not feasible. SHUFFLE PLATE: A permanent, external modification by adding a smoother, more slippery material to the forefoot of a client’s shoe. This is useful when the client is unable to fully lift the forefoot, specifically when walking in a carpeted environment. SOLE BAR: A steel or carbon fibre, full-length bar, laminated between the sole and midsole to eliminate dorsiflexion. SOLE LIFT: A permanent, external modification of the midsole and outsole to add a prescribed amount of height to one or both shoes. 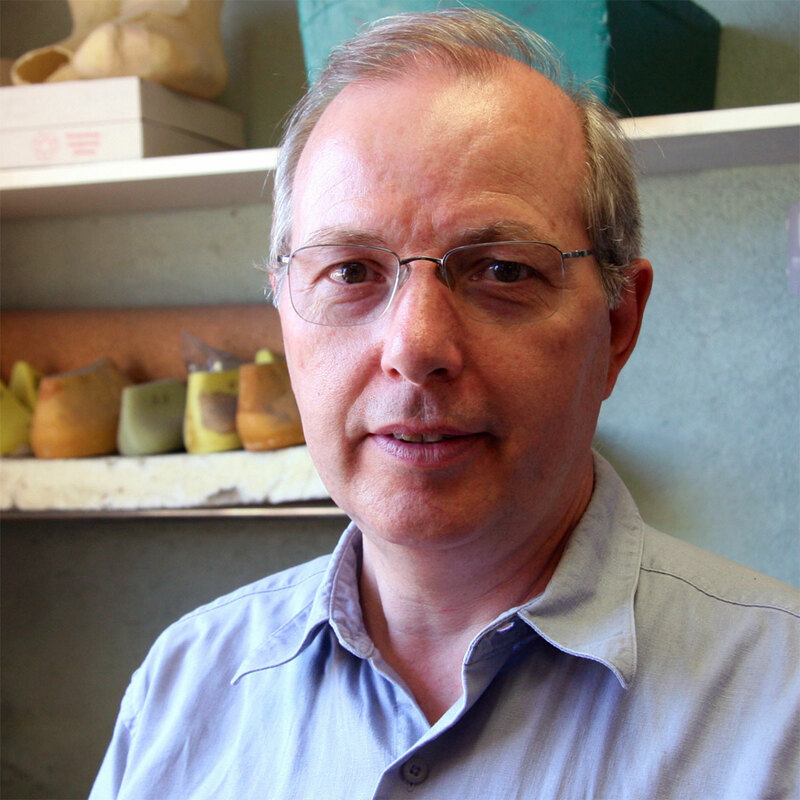 THOMAS HEEL: An anterior medial extension longer than the standard heel to add rearfoot or midfoot support medially.